NiceHash has recently added Ethereum support (Dagger-Hashimoto algorithm) to their service for leasing or renting hashrate and now they have released an updated version of the NiceHash Miner to support it along with some more new algorithms. 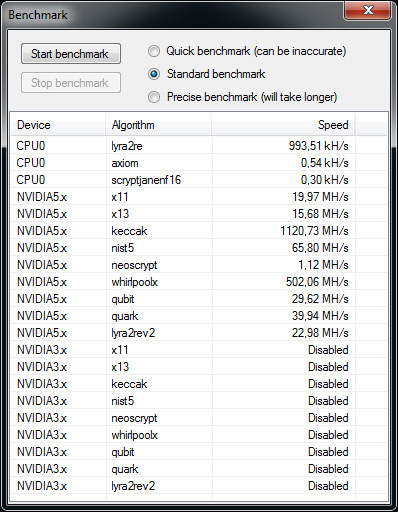 NiceHash Miner 1.3.0.0 (source) adds support for Ethereum mining for AMD and NVIDIA GPUs as well as support for Blake256r8, Blake256r14 and Blake256r8vnl algorithms for AMD and NVIDIA GPUs. The application switches automatically between the currently most profitable algorithm and makes mining with the CPU or AMD/Nvidia GPUs an easy task for novice users bringing in the highest return for the miner. The application essentially leases your hashrate to users that are willing to pay for it and you get paid directly in Bitcoin. This means that you no longer need to follow exchange rates and to manually trade different crypto currencies, however this also means that directly mining and exchanging a given crypto currency at the right time might be more profitable than to lease your hashrate. 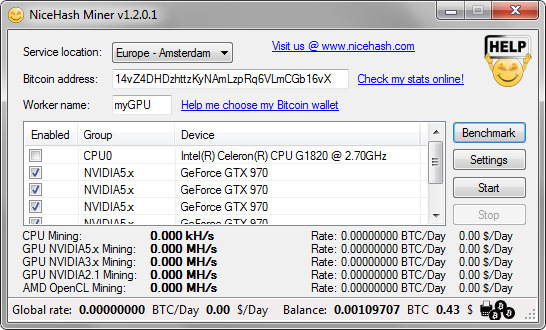 The NiceHash Miner software is a GUI for CPU and GPU mining on NiceHash using cpuminer-multi, ccminer and sgminer as a backend for the actual mining process. The software itself has been available for a while, but initially it had CPU support only and then Nvidia GPU mining was added and now it also comes with AMD GPU mining support built in as well. In the current version all modern CPUs are supported, full range of NVIDIA GPUs from Compute capability 2.1 up to the most recent Maxwell with Compute 5.2 as well as support for all AMD GPUs with OpenCL support, including all 5xx, 6xx, 7xx and R9 series. 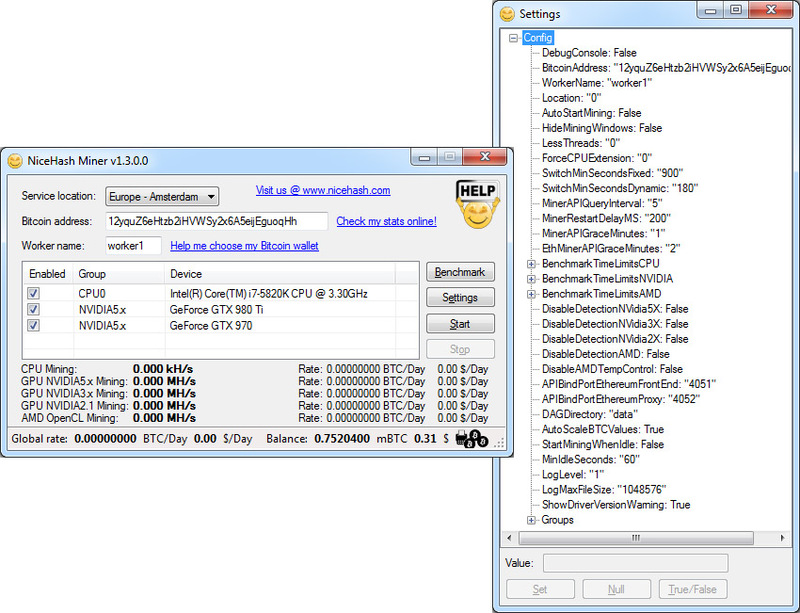 The newly added sgminer for AMD GPU support also comes with highly optimized pre-built compute bin files for most common AMD GPUs based on Pitcairn, Tahiti and Hawaii chips for X11, X13, X15, Qubit and Quark algorithms – also known as wolf0 and kachur optimized bins in order for the software to get you the best performance. So if you want to mine the most profitable crypto currency on Nicehash and get paid directly in Bitcoin, you might want to check out the NiceHash Miner software. All you have to do the first time you run the software is to enter your Bitcoin wallet address, run the Benchmark mode to determine your hashrate and then you can start mining the most profitable algorithm at hte moment. Do note however that it is only available for Windows! The guys at NiceHash have released a beta version of their own easy-to-use best-profit auto-switching application called NiceHash Miner. The software detects what crypto mining capable hardware you have in your systems (for now supports only Nvidia GPUs and CPU mining), checks your hashrate and automatically switches to the most profitable algorithm available to give you the best profit for your hashrate. All you have to do is download and run the miner, choose the server location and enter your Bitcoin wallet address where you want to get your coins sent at and you are almost ready to start mining and maximizing your profit. As a backend the NiceHash Miner relies on the cpuminer-multi form tpruvot for CPU mining and to the ccminer forks from tpruvot and sp for the Nvidia GPU mining.